Cupid’s Chase 5k | Community Options, Inc.
Community Options was founded in 1989 by Robert Stack, who is currently CEO and president. Over the next few years, we have identified five key objectives as part of our ongoing strategic plan: expand services, leverage technology, cultivate personnel, improve fiscal operations, and enhance marketing and development. We are confident that we will achieve the goals set forth by our Leadership Team by 2020. Community Options is a progressive, national nonprofit organization that has been in operation for over 35 years. Community Options believes in the dignity of every person and in the freedom of all people to experience the highest degree of self-determination. Our focused efforts include developing residential housing, specialized programs for medically fragile adults, entrepreneurial businesses, employment supports and transitional education programs benefiting thousands of individuals with disabilities and their families. Community Options recently celebrated the opening of our 500th home. We secured a donation to open our second Vaseful flower store, providing employment to people with disabilities. The flower store is expected to open in the fall. We’ve continue to expand our services with homes for people with disabilities that recently opened in Princeton, Marlton, Franklin and Willingboro. We have plans to open an additional six to 10 homes within the next year. Community Options holds two annual fundraising events. 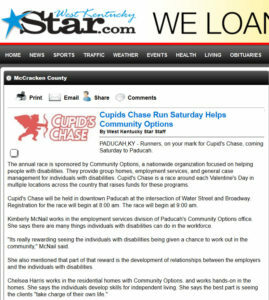 The first is the Cupids Chase 5K race, held over Valentine’s Day weekend. In 2018, there were 38 races across the 11 states that Community Options operates in. Funds are raised through runners as well as corporate sponsorships. The second major fundraising event is the Annual Golf Classic, which took place this year at Jasna Polana in Princeton. Throughout the year, Community Options’ executive directors will also hold various fundraisers for their local offices. Many of these include partnering with small businesses in their local communities. Community Options is supported by many local businesses in the areas that we serve. All of our offices are supported by a Community Options Business Advisory Council, or COBAC, which advises executive directors on local economic trends, establishes and maintains corporate and civic connections, and raises funds for local programs. COBAC members include representatives from Robert Wood Johnson, Staples, New Jersey Association of Women Business Owners, Yardville National Bank, Haldeman Ford, Pepper Hamilton, First Washington State Bank, Sovereign Bank, the National Association of Catering Executives and many other prominent lawyers, consultants and business leaders. As a national agency, Community Options seeks to promote the inclusion of people with disabilities in the community through person-centered and natural supports, and collaboration with community partners to increase accessibility to services. Community Options does not administer any large congregate programs, recognizing that people with the most severe disabilities need environments, equipment, clinical and staff support that are tailored to their very specific needs to enable them to live life to their fullest potential in the community. Reach Svetlana Repic-Qira, regional vice president, Community Options, at: Svetlana.Repic-Qira@comop.org or at 973-905-4015. Serving: We are a national nonprofit organization providing services to people with disabilities. We are based in Princeton; however, we currently operate in 11 states: Arizona, Kentucky, Maryland, New Jersey, New Mexico, New York, Pennsylvania, South Carolina, Tennessee, Texas and Utah. Logan shows off his medals at the 2018 Cupid’s Chase race in Paducah. McCRACKEN COUNTY, KY- Local 6 is helping 10 people Go The Distance. They’re training with Atlas Physical Therapy and Paducah Athletic Club experts to run a half marathon. 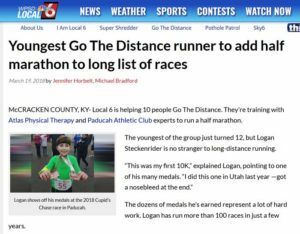 The youngest of the group just turned 12, but Logan Steckenrider is no stranger to long-distance running. The dozens of medals he’s earned represent a lot of hard work. Logan has run more than 100 races in just a few years. 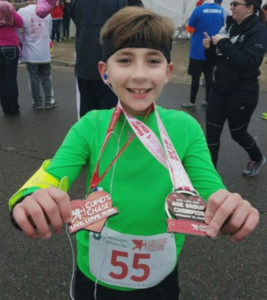 We caught up with him at the Cupid’s Chase in February, but his mom, Mindy, has faithfully documented each run. She remembers one of his first races, the Paducah-McCracken County United Way Barbecue on the River Kids Run. It was just a mile. “I just liked the idea of being faster than everyone,” Logan said of what got him passionate about running. Logan is now taking his dedication to the next level. What’s his current training regiment? “I do two tempo runs a week. I do one cross training, one hill, and then one long run,” Logan said. He’s working with the experts at Atlas Physcial Therapy and Paducah Athletic Club to improve his form. “I learned that I kind of run with one foot in and the other one straight,” Logan said. Logan has a mindset as he tackles this big goal. “It’s gonna’ be hard to do at first, but once you’re done, you’ll be excited and happy,” Logan said. “I don’t know what’s after a half marathon for him,” his mom said. There’s no doubt that whatever it is, Logan is sure to go the distance. Logan will run the Iron Mom Half Marathon in Paducah in May. 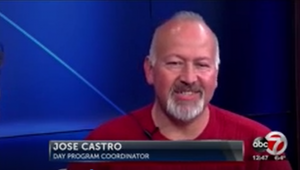 Jose Castro joins the Noon News to discuss the upcoming Cupid’s Chase 5K. 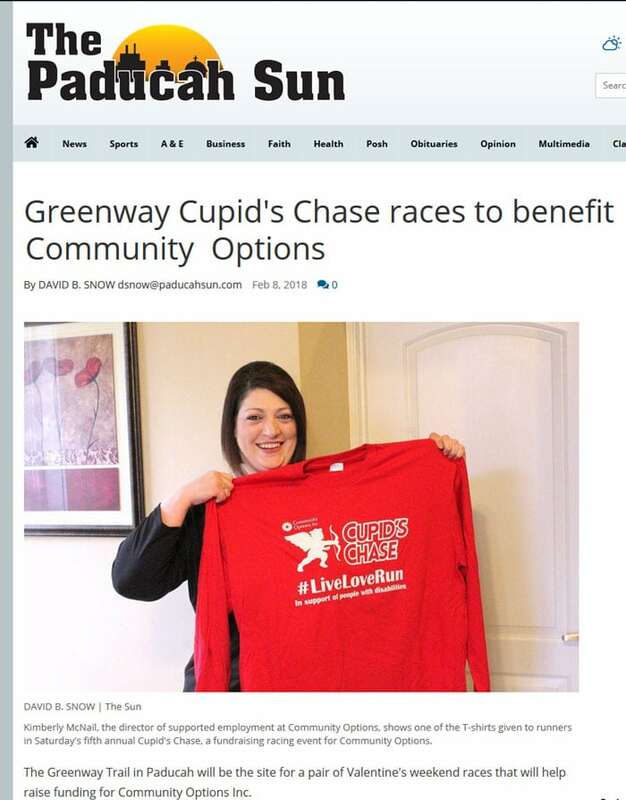 Kimberly McNail, the director of supported employment at Community Options, shows one of the T-shirts given to runners in Saturday’s fifth annual Cupid’s Chase, a fundraising racing event for Community Options. The Greenway Trail in Paducah will be the site for a pair of Valentine’s weekend races that will help raise funding for Community Options Inc.
Community Options opened in Paducah in 2013, providing services to people with disabilities to help them find jobs and make themselves more self-sustaining. Proceeds from the races – called “Cupid’s Chase” – will help fund Community Options services. Kimberly McNail, who is the director of supported employment at Community Options, gets job referrals for the Office of Vocational Rehabilitation. “We assist individuals that are referred to us, whether they’re in our residential program or they live in their own home or their family’s home,” she said. There are 58 Community Options locations in 11 states, including Paducah, Bowling Green and Alexandria in Kentucky and Nashville, Chattanooga and Cookeville in Tennessee. 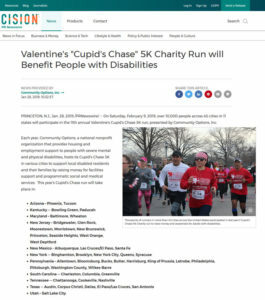 Cupid’s Chase includes 5-kilometer (3.1-mile) and 10-kilometer (6.2-mile) races to be held Saturday along the Greenway Trail. The registration begins at 8 a.m. at the intersection of Broadway and Water streets, and the races begin at 9 a.m. The race will involve runners, walkers, strollers and wheelchairs to help raise funds for Community Options. “All of the Community Options sites nationwide do the race on the same day,” McNail said. Cupid’s Chase serves as a fundraiser for Community Options and its programs. The Paducah Cupid’s Chase began in 2014, marking its fifth year. PADUCAH,KY – Runners, on your mark for Cupid’s Chase, coming Saturday to Paducah. The annual race is sponsored by Community Options, a nationwide organization focused on helping people with disabilities. They provide group homes, employment services, and general case management for individuals with disabilities. 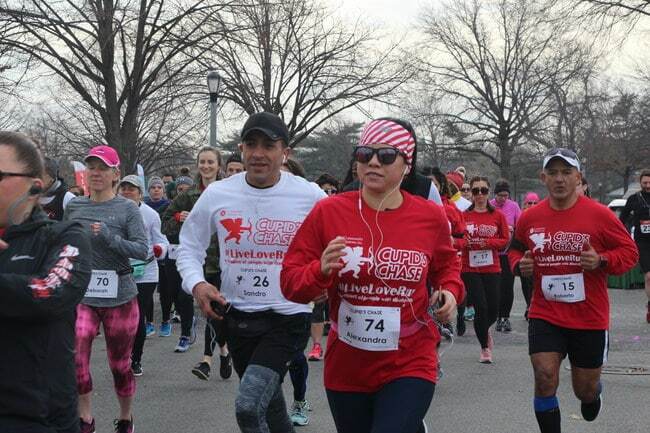 Cupid’s Chase is a race around each Valentine’s Day in multiple locations across the country that raises funds for these programs. Cupid’s Chase will be held in downtown Paducah at the intersection of Water Street and Broadway. Registration for the race will begin at 8:00 am. The race will begin at 9:00 am. Kimberly McNail works in the employment services division of Paducah’s Community Options office. She says there are many things individuals with disabilities can do in the workforce. “Its really rewarding seeing the individuals with disabilities being given a chance to work out in the community,” McNail said. She also mentioned that part of that reward is the development of relationships between the employers and the individuals with disabilities. Registration for Saturday’s race is $30 per person if you register before Friday. On race day, the cost is $40.